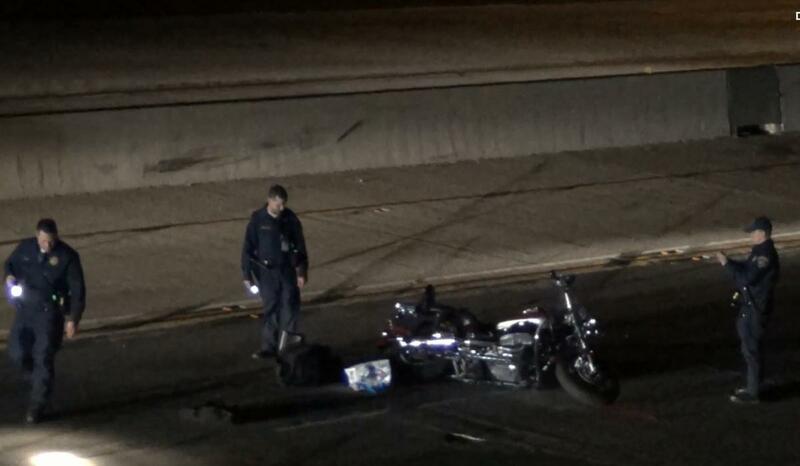 ANTELOPE VALLEY – A 56-year-old Castaic man was killed Saturday night after he lost control of his motorcycle as he was entering the 14 Freeway, authorities said. The fatal collision happened around 8:25 p.m. on the Antelope Valley (14) Freeway, just south of Pearblossom Highway, according to a California Highway Patrol report. Gayle G. Swaim was entering the southbound 14 Freeway lanes from Pearblossom Highway, on a 2004 Yamaha Classic Star, when the left foot rest of his bike hit a raised curb causing Swaim to lose control, according to the CHP report. The motorcycle fell to its right side, and Swaim was thrown onto the roadway, resulting in fatal injuries, according to the CHP report. The motorcycle continued into the southbound No. 2 lane, where it was struck by a 2003 Toyota Camry, driven by 54-year-old Janet D. Moser of Palmdale, according to the report. Moser, who was driving about 65 miles per hour, was not injured in the collision. Swaim, who had been traveling at an undetermined rate of speed, was pronounced dead at the scene. 8 comments for "Motorcyclist hits freeway curb, dies at scene"
I came upon this accident almost right after it happened. I went by about 8:15, so it actually happened about 8 pm. So, so sad! My condolences to all! Unfortunately he was the shipper guy where my husband works. As a fellow licensed motorcyclist my heartfelt condolences go out to the family and friends of this unfortunate sole. This horrible tragedy certainly could have been prevented. Small operator on a big motorcycle is truly a poor combination. Fault lies with those who failed to educate this rider. As a result it is the friends and family that now feel the loss. Maybe too much media espousing the “biker lifestyle” without the corresponding operator education as to the rate and depth of tragedy incurred on these freedom machines. Man or woman, this is so sad. My husband of 25 years rode a bike for years and thank goodness nothing ever happened to him. My heart goes out to the family of the rider. Other sources are saying the victim in this accident was a woman. Sad to see another rider being killed.